A cute crochet bunny will put a smile on anyone's face this Easter. Stuffed animal bunnies of all sizes can make great gifts for little ones. Crochet bunny hats are great for baby's first Easter and springtime family photos. Bunny egg cozies, bunny bunting, and other bunny decor will bring all of your Easter parties to life. These fourteen Easter crochet patterns all feature bunnies in one way or another; choose the ones that are most your style and get to hooking! This amigurumi Easter bunny has a completely different style since it's made with Japanese inspiration. It's a strawberry pink smiling bunny that will make you smile too! You get two patterns in one with this pastel crochet pattern. On the outside is a striped Easter egg that you can use for decor in or out of Easter baskets. Flip the egg inside out and you get a precious little Easter bunny. The pattern also includes instructions for making a crochet chick inside its own egg to go with your crochet bunny. It can still be a bit chilly when Easter rolls around. Keep your mug of chocolate or coffee warm with this cute Easter bunny crochet cozy. It is a simple design accented with bunny ears and a pom tail. The first thing that every child needs for Easter is a basket. 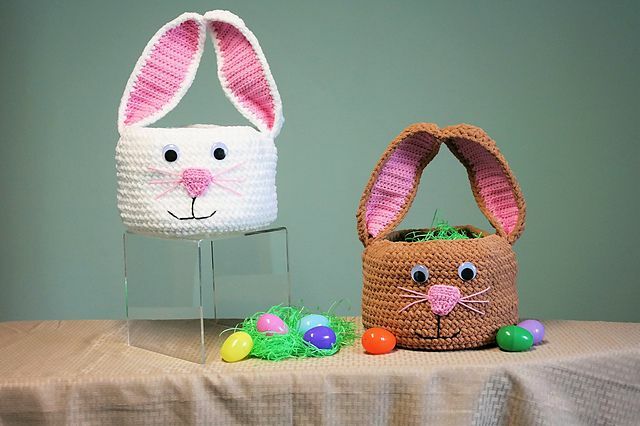 There are many terrific crochet Easter basket ideas out there and some of the best incorporate the bunny into the design. This free crochet basket pattern is a simple, sturdy pattern that is perfect for egg hunting. The ears come together to create the handle for the basket. Crochet Easter egg cozies add decoration to your eggs whether you've painted them or not. They can be full cozies that enclose the entire egg or crochet egg hats like the one pictured here. This free pattern is a simple representation of a bunny's ears. Bunny hats are a wonderful item to crochet for Easter. Their floppy ears make a basic hat really special for the holidays. This one has a cute face on it that is easy to make. The crochet pattern comes in seven sizes so you can make one for everyone in the family. This is perfect for keeping track of big groups during an Easter outing; put one on everyone's head and you'll easily spot your own group in a crowd. Crochet Easter bunting can be draped along a table at an Easter party or used to decorate a DIY Easter tree. This free pattern is a simple bunny seen from the back with its cute little bobble tail. It is strung on a basic crochet chain. The same pattern could be used to make an Easter bunny appliqué for other projects. If you are going to crochet a bunny this Easter, a stuffed animal bunny is a terrific choice. They are so cute and any kid who receives one will enjoy cuddling with it all year long. This bunny is rounded to be perfectly snuggly. Can't you just picture a toddler carrying it around by the ear? Make a really cute stuffed crochet Easter bunny without a lot of effort using this great free pattern that includes a video tutorial. These bunnies work up quickly; craft a bunch of them and hide them instead of eggs for children to collect on Easter day. If you want to crochet a bunny toy that works up more quickly than a full-sized stuffed animal, why not make a crochet finger puppet? This cute bunny is designed with big eyes and floppy ears that will put a smile on everyone's faces. This amigurumi Easter bunny crochet pattern comes with different sizing options. Make one represent each person in your family for a very cute, personalized Easter display in your home. Hang a crochet wreath on the door of your home to celebrate every holiday and change of season. This one has an amigurumi bunny in the center and the cute "Hoppy Easter" slogan. It is welcoming to everyone who comes to your home. This security blanket, also called a lovey, has an Easter bunny inside of a granny square. This is great for babies to use at any time​ of year, and of course, also makes for a perfect Easter gift. This crochet cozy is advertised as a beer bottle cozy but it works just as well for a water bottle or even a soda can, so it's a good design for anyone. Tuck your own drink into this bunny cozy and you'll easily be able to see which drink at an Easter party belongs to you!